In which the Parsimonious Princess waxes nostalgic and sings the praises of line drying clothes. Throughout my childhood, we had a clothesline. It was just out the back door of the house, right past the laundry room. In many ways, the clothesline almost seemed like an extension of the house, like an outdoor adjacent room. I can clearly remember my mom always hanging out the laundry. I loved to play in the damp rows of clean towels, cloth diapers, jeans, and sheets as they billowed in the breeze. 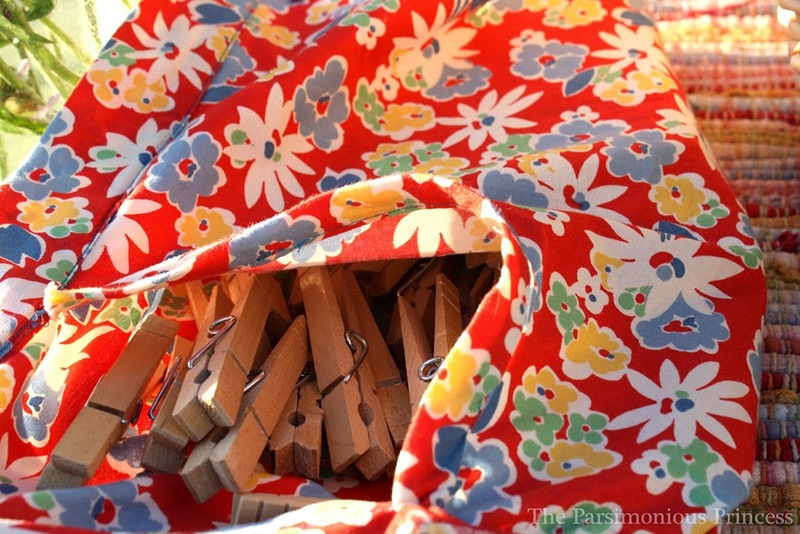 And, to this day, one of my very favorite smells is clean sheets that have been dried on a clothesline; when you lay down to sleep on them the smell is heavenly. If the sun has a smell, that has to be it. 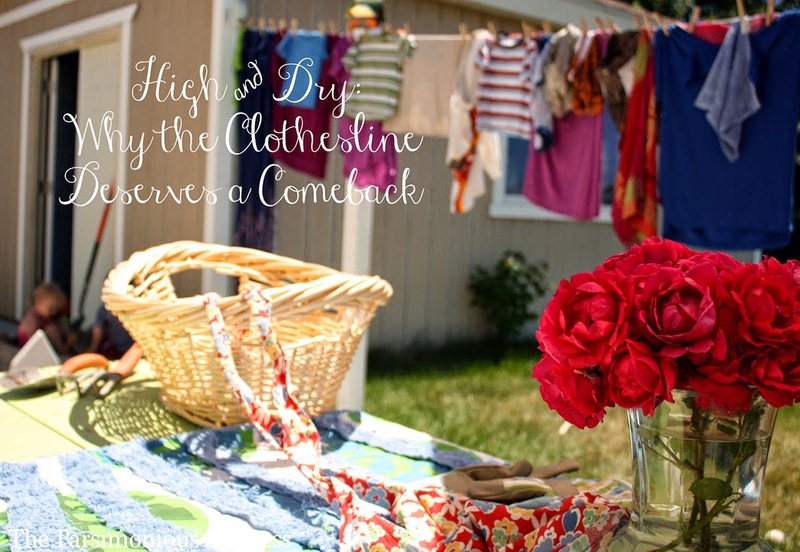 When my family moved away from the house with the conveniently-placed clothesline, my mom used the clothesline less and less for everyday laundry, though she still used it for sheets and pillowcases. I've also since learned that dryers are a major energy-using appliance. According to the U.S. Department of Energy, the clothes dryer alone uses up around six percent of your home's energy usage. Of all household appliances, the clothes dryer comes in at #2 for using the most energy; the refrigerator comes in at number one. Isn't it interesting though, that, unlike the refrigerator that is on 24/7, the dryer ranks so high even though it is only used in spurts, just a few times a week? I've read that running a clothes dryer is the equivalent of turning on 225 CFL lightbulbs for an hour. And that's for an appliance that we don't have to use. Let me repeat that. You don't have to use a dryer. Turns out, when you leave North America, the dryer becomes less and less of a necessity for people. In one article I read, 85% of American households have a dryer; in the UK, only 57%. When you hit mainland Europe, the percentages go even lower. Italy has the lowest percentage -- it's reported that only 5% of homes own a dryer. Around the world, this is the case. The clothes dryer is really a luxury appliance. There are so many benefits to using a clothesline: they're inexpensive, they save you money on your energy bills, they help your clothes last longer, the sun bleaches out stains better than almost anything, and line-dried clothes smell so fresh and clean. So why don't more people use a clothesline? Why have they become a thing of the past for so many Americans? I have a few speculations why they aren't popular here, along with some solutions. Problem #1: Air-dried clothes are stiff and rough, not nearly as soft as clothes from the dryer. When I mentioned that I wanted to use a clothesline to my husband, he groaned and told me about how much he hated how stiff his clothes were from the clothesline when he was a kid. This can be a definite drawback, but it isn't without a solution. Solution: One way to get soft line-dried clothes is to tumble them in the dryer on the cool/fluff setting for 5-10 minutes before hanging the laundry. Sure, you're using the dryer, but since the heat element isn't on, it doesn't use much energy. I line-dried cloth diapers and kept them soft using this method. (For the side-by-side comparisons, you can read more about it on a post I wrote here.) If you don't have a dryer or you don't want to use it, vinegar goes a long way in helping clothes stay soft, too; it's a great natural fabric softener. (You can find more tips about using vinegar in the laundry here and here.). A third solution: just get used to the stiffness of air-dried clothes. It's really not that bad and goes away after you wear the clothes for a while. Upside: Even if your clothes are rough (which, if you use my methods mentioned above, they won't really be), the fresh, sunny smell of laundry dried outside totally makes up for it. Problem #2: Clotheslines aren't as convenient as a clothes dryer. That's totally true. That's the reason I don't line dry all of my laundry. Let's face it: it is more convenient to just toss wet laundry into the dryer instead of hauling it out and hanging it on the line. But you know what? It's not that inconvenient. It really doesn't take a lot of time to hang up a load of laundry -- and it's actually kind of enjoyable on a sunny summer day. Solution: If you're reading this blog, you know that being eco-friendly sometimes takes some forethought and a little extra work at times. Take plastic bags at the grocery store: they're certainly more convenient, but it is really that hard to take your own? Same goes for hanging laundry: when you weigh the pros and cons, it becomes a trade-off that you're willing to make. Upside: I've found that line-drying actually makes folding clothes more convenient since I fold my laundry as I remove it from the clothesline. It's much less daunting than a mountain of laundry that tumbles out of the dryer. Problem #3: Clotheslines aren't allowed due to homeowner associations or community restrictions. This is a legitimate problem that many people face because some homeowners associations (HOAs) think that clotheslines affect the look, perceptions, and aesthetic feel of the community. Some HOAs will even threaten legal action for people who violate the rules and use a clothesline outdoors. Solution: One solution is to dry your clothes indoors on retractable clotheslines and drying racks. But if you want all the benefits of air-drying outside (like the fresh smell and the stain-fighting power of the sun) but your HOA won't allow it, speak up! One resource/ally: Project Laundry List, where you can find resources and help. Enough people have spoken in favor of having clotheslines that my home state of Utah, along with Florida, Maine, Vermont, Colorado, and Hawaii, have passed laws that actually restrict housing authorities from banning clotheslines. Upside: Since I live on the corner of my neighborhood, everyone pretty much sees what's going on in my yard. I can't tell you how many nice comments and compliments I've gotten on my clothesline; people have even called my retractable clothesline, laden with clothes, "cute". I tell you, there's a sort of happy nostalgia to clotheslines that people like. Let me perfectly clear: I am not against using the clothes dryer. Not at all. I use it throughout the winter months and I use it year-round for my towels, in particular. Some days are busier than others and sometimes the weather outside doesn't cooperate. But imagine the difference if everyone air-dried even just one load of laundry a week. I'm a huge believer that little actions add up. And one more reason the clothesline deserves a comeback: I believe they're good for your soul. Seriously. I love standing outside, in the fresh and sunny weather, hanging up laundry. As I do my laundry, I watch my kids playing in the yard, I hear birds in the trees, I feel the breeze. and when I have to hang each article of clothing, one by one, I can't help but think of the person who wore that item of clothing. My seven-year-old's soccer jersey. My three-year-old's denim overalls. My husband's funny t-shirts. You don't get those same moments of reflection and gratitude when you shove clothes into the dryer. Hanging clothes outside is a simple act, but I love it because it makes me slow down. Spring is full swing and summer is on our doorstep. Now is a perfect time to go all old-school and get a clothesline. When you get a whiff of the sweet-smell of your clothes, you'll be glad you did. My grandparents have a combination clothesline/ rotating tire swing. You could hang a load of laundry up and the kids would help dry it as they played. Of course they don't use it much anymore because of their age. I am in LOVE with our clothesline. It is one of the main selling features of this house for me. Also, was chatting w a coworker who lives rurally and was flabbergasted that she just doesn't have a clothesline... I just figured if you lived rurally and ahd the space- why wouldn't you? Over the past month I have learned a TON of little tricks for hanging clothes that I didn't learn from my mom while growing up. I am going to try the vinegar idea though- that is fantastic. You know, maybe I should go back to line drying clothes. I wrote a post about it waaaay back in 2008. I forgot how much I used to love the peace of hanging clothes - it was almost as good as meditation. And you are so right, it was SO easy to fold clothes when taking them off the line. I have a good friend who feels much the sane way - considers line drying this serene meditative experience. I confess I don't feel quite the same way. But you do make many excellent points here that make me want to start doing it more. Perfect season for it! Yup, HOA laws stink... We would have loved to have one otherwise. But we do have a small portable rack we sometimes use. My mother never had a clothes dryer and I don't have one either. I live in France and here most people I know use a clothes line, we are in the alps and have 7 month winters. Maybe it depends on the type of water you have in your area but my clothes are never stiff - I use a home made laundry soap. I enjoy hanging my clothes out to dry, very soothing activity, it's the putting them all away after that I find less fun! Poisoning Paradise: Are Your Plants Killing Bees? DIY "Suet" Bird Feed Block! Eco Rock Star In The House!